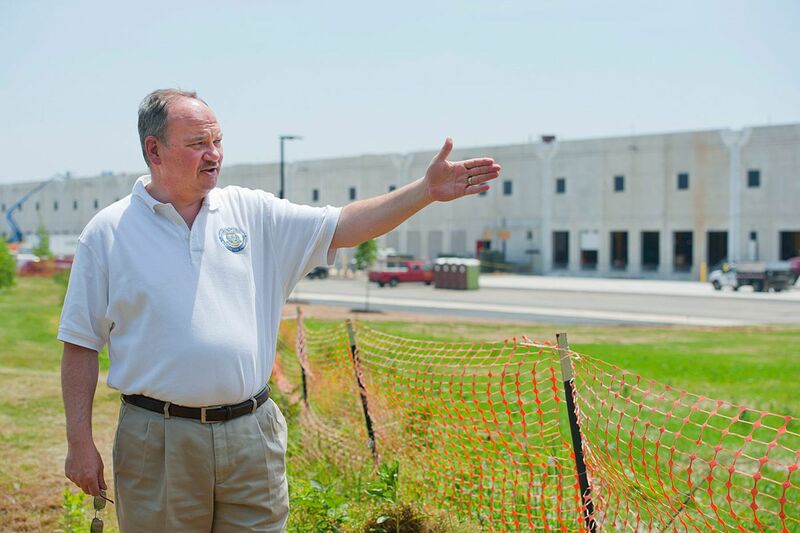 Mayor Craig Wilkie stands outside the massive, still under construction Amazon.com distribution center in Florence Township, NJ. As a boy growing up in Florence Township, Craig Wilkie knew that the New Jersey Turnpike ran through farmland on the east side of town, the Pennsylvania Turnpike began west of the Delaware River, and neither was easy to access. Today Wilkie, 49, is mayor of this river town of 12,000. And those once-remote turnpikes are its economic lifeblood: arteries to a pulsing "I want it now" retail economy hungry for next-day delivery. One key to satisfying e-consumers in the Age of Amazon is the well-situated distribution center. And Florence, soon to be the newest node on Amazon.com's distribution grid, finds itself well-situated, indeed. "This used to be all wooded," Wilkie explained last week as he cruised down Cedar Lane during his lunch hour. To his left, grading equipment sat in a newly cleared field. Off to his right, a 600,000-square-foot concrete box glowed white in the afternoon heat. Amazon announced last month that it had taken a long-term lease on the new building, due to start operations by late summer. A bustle of forklifts, front loaders, and cherry pickers was getting it ready last week. Clean, relatively quiet, and projected to provide 500 steady jobs, the Amazon building alone would be the envy of many a mayor anywhere. But this flat-topped behemoth is just one of a dozen giant distribution centers that have risen over Florence in the last decade, comprising 5.5 million square feet of floor space and employing about 2,500 workers. "Subaru was half a million square feet when they came here in 2013," Wilkie remarked later on his drive around town. "Now they're at one million," he said, pointing out the window to another vast concrete box off Route 130. Perched atop a manicured green lawn and flanked by a small parking lot sat the Japanese automaker's largest parts distribution center in North America. Here, 50,000 parts wait to ship or fly across the nation at a moment's notice. The drive also looped Wilkie past the 249,000-square-foot Express Scripts pharmaceutical distribution center next to Subaru, then across Route 130 to the 406,000-square-foot Destination Maternity center and a vast 721,000-square-foot center servicing Bed Bath & Beyond. And more is on the way, including a 577,000-square-foot center due to rise near Amazon (it's awaiting a tenant), and a facility of 377,000 square feet next to Subaru that will service QPSI, a supply-chain and product packaging firm based in neighboring Burlington Township. It has been a sharp economic recovery for Florence, once a major steel town. Starting before the Civil War, Florence was home to a succession of pipe factories, and from 1905 to 1974 to the mighty Roebling Steel Co., maker of girders for the Golden Gate and George Washington Bridges. All have since closed their doors, but the toxic chemicals they left behind made Roebling a Superfund site, and the Environmental Protection Agency still monitors sludge left by the former Griffin Pipe Products Co.
What makes Florence and its northern Burlington County neighbors such as Burlington Township and Mansfield ideal for distribution centers is that "it's one day's truck drive" to anywhere in the affluent Northeast, explained Mark Remsa, Burlington County's director of economic development and regional planning. Modern distribution centers are not mere "warehouses" where goods might sit for weeks or months, Remsa said in an interview last week at his Mount Laurel office. Rather, they are engines of "e-commerce fulfillment" for retailers such as Amazon, or soon-as-needed suppliers to bricks-and-mortar retailers such as Bed Bath & Beyond and Destination Maternity. Creation of the River Line light-rail route between Camden and Trenton in 2008, with station stops in both the southern Florence and its northern, unincorporated Roebling section, has helped to make the town attractive to employers needing high numbers of workers, according to Remsa. But the centerpiece of its connectivity has been Route 1-276: a four-lane highway slicing through town that links the New Jersey Turnpike to the Pennsylvania Turnpike, and links Florence to both. "There are more and larger distribution centers around Exit 8A in Middlesex County," near Cranbury, Remsa said. "But that area is just about built out. So the private sector has been asking itself, 'What's the next 8A?' And that happens to be Exit 6A," in Florence. Mark Goldstein, a vice president at Liberty Property Trust L.L.C., builder of the Amazon site, agreed. "It's the exit where the Pennsylvania Turnpike and New Jersey Turnpike come together, so that's certainly a benefit," he said. "And now that the [New Jersey] Turnpike has been widened, the bottleneck south of 8A no longer exists," said Goldstein, head of Jersey operations for the Malvern-based firm. The bottleneck "historically had limited some companies from going to 6A," he said. His firm built what would become the Amazon site "on spec," without a committed client, Goldstein said, because it was so confident that it would find one quickly. Michael Landsburg, vice president for real estate at NFI Industries, developer of the Subaru and QPSI sites, said his firm first began acquiring acreage along Route 130 in Florence in 2004 for its own freight business. But NFI soon saw opportunities, he said, as a property developer for third parties. Unlike Liberty, he said, NFI doesn't build on spec but signs with clients and builds to suit. The New Jersey Turnpike's southern widening project was a major reason NFI chose to do business in Florence, Landsburg said, but another "driver to 6" - meaning Exit 6A - was Florence itself. "They've been phenomenal," he said. "Always willing to hold special meetings and work through issues," especially when prospective tenants are anxious to move in. Landsburg also praised Remsa and other Burlington County leaders for their "solutions-oriented" approach, including tax benefits that made the township especially attractive to prospective tenants. "The tax savings here are probably 50 to 60 percent better than what you find" around Exit 8A, he said. "Mayor Wilke and [township administrator] Richard Brook clearly understand that you can do what's best for your community while still providing for the needs of business," he said. "I'd like to continue to grow in Florence," Goldstein said.